If your are using terminals on other operatings systems than OS X on a daily basis, you might have noticed that the Terminal App behaves a little bit different in some aspects. When I installed my iMac a year ago I needed some time to adopt everything to my needs. Yesterday, I received my new MacBook Air running OS X Lion and when I tried to get everything like on my iMac I found some things which changed in Lion. So I decided to write a small post about my Terminal tweaks. Black or White? Everybody has another opinion in which colors the terminal should appear. I'm used to the white font on black background version. 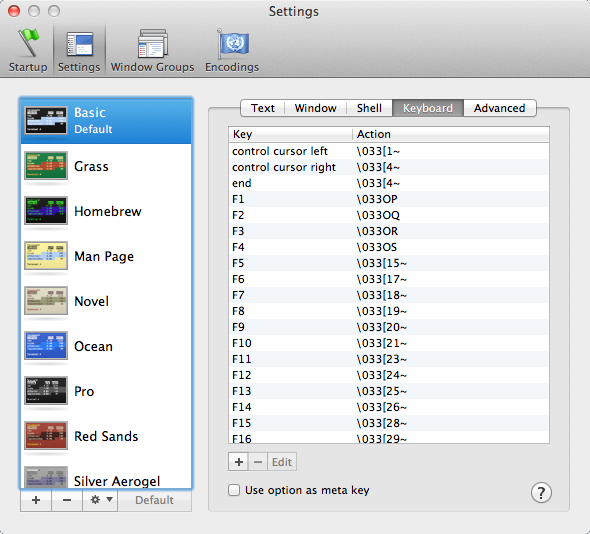 To adjust this, select Preferences in Terminal menu (or press ⌘ + ,). Go to the Settings tab and select the Basic profile in the left column. There are five panels in the right panel. 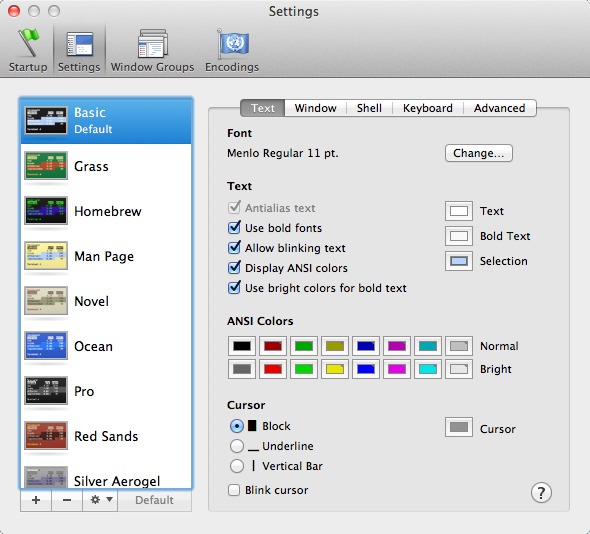 In the Text panel set the Text and Bold Text to white and in the Window tab select a black background color. I recommend setting a transparency of about 90% for easy distinction of different overlapping terminal windows as they have no border as in other operating systems. When type "exit" or "logout" or press ctrl + D to send EOF to your shell the shell terminates. On Linux xterm or other Terminals programs close the active window when this happens but the Terminal App window stays open with a "[Process completed]" message. 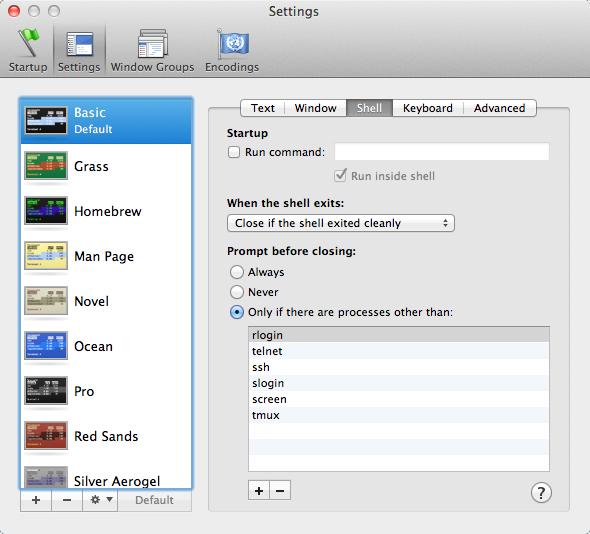 This is very annoying as you have to close the terminal by hand or pressing ⌘ + W. If you want the Terminal App to close the window when the shell exits, go to the Shell panel in the Preferences dialog (see Colors section how to get there) and set "When the shell exits:" to "Close if the shell exited cleanly". Besides of configure the correct key assignments this also sets some comfort features and 8bit support of the bash. Feel free to adopt it to your needs. You can find more information on the official manual page. This sets a colored bash prompt and creates alias for ls and grep to use the colored version. Also the window title of the Terminal App is updated after each command with the current username and path. WordPress seems to change some of the quotes in the text to pretty quotes. To avoid problems you can download my complete .profile File. This entry was posted in Software and tagged Apple, Lion, OS X by twam. Bookmark the permalink. I have just one problem. I'm in the same situation, I have a MBA 13", the new one with Lion, and I tried to make my Terminal more friendly. So I copied your .profile code in a new .profile I edit with vi in my home-directory, but it didn't work. Do you have any idea of what I have to do? Sorry, I was too lazy to find by myself. For the people in the same situation, you have to modify all da simple and double quote character. I don't quite understand your last sentence. In Linux I use Alt-Backspace and Alt-d to backspace and delete over words. In OS X I can use Escape and d and Backspace, is there any way to get the Command key to work like Alt so I don't have to change the way I type when on OS X? Bind some key (like alt+Backspace) to 33\177 in Terminal settings. Good tips, but if I use your .profile for colored prompts, whenever I use "su -" or "sudo -i", I get "-ne" above every prompt while I'm root. I did have to change most of the quotes throughout since WordPress automatically converted them to pretty quotes. Any ideas on how to fix that? Thanks for the hint with the quotes. I added an link to the end of the article for my complete .profile file. Maybe this fixes your problem. If not, the -ne option tells the shell's echo command to interprete escape sequences. Maybe you're using another shell than bash. @Robin In Setting->Keyboard, select "Use Option as meta key". Sorry for the late comment, should be grep --color=auto in your .profile(opposed to -color), or your grep command will break. Thanks for the hint. It is actually right in my post but silly WordPress replaces two single - with an longer –. The same is true in your comment. I have to find out if I can disable this silly behaviour.